These days I’m all about cooking easy meals, and if they only dirty one dish, then that’s even better. I’ve shared a couple of my favorite one dish meals in the past, but it’s been a while, so I thought I might share another with you today. 2. Lightly grease the 9x13 pan and set aside. 3. Trim and wash your chicken breasts and season with garlic, salt, and pepper. 4. Cut potatoes into bite size pieces. 5. Cut broccoli into bite size pieces. 6. Arrange the red potatoes down one side of the pan. 7. Arrange the broccoli down the other side of the pan. 8. Place the seasoned chicken breasts down the middle of the pan. 9. 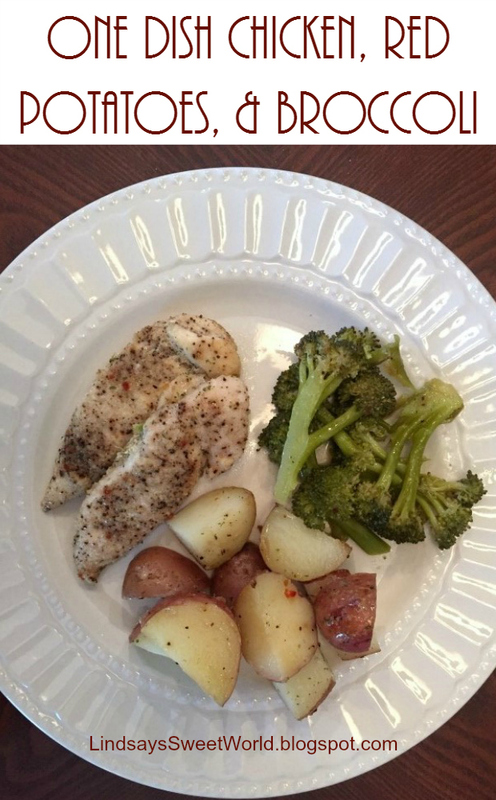 Sprinkle the packet of Italian dressing powder all over the potatoes, broccoli, and chicken. 10. Pour the melted butter all over the potatoes, broccoli, and chicken. 11. Cover the pan with aluminum foil and bake for 1 hour. I like this meal because, despite the butter, it feels pretty light so it’s perfect for summer. And it only dirties one dish which makes for the easiest clean-up! Plus it only takes a few minutes to prep and then it's totally hands-off for an entire hour which frees me up to unpack book bags, tidy up, set the table, and get things ready for the next day! Let me know how you like it if you try it! And enjoy! That looks so delicious! And easy! Perfect for busy summer nights! I love simple and quick!! Looks great. Adding this to my list! Yum! I love easy meals!! Yummy! I'm all about a one dish, easy clean up kind of meal! Yep, anything to make clean up easier! I make this often...so easy and so good! Sometimes I switch out the broccoli for other veggies! Yum! Looks good! And dirtying one pan, I'm in! Looks good! I am fresh out of dinner ideas right now, so I'm taking any suggestion. I'll have to add this to my list! only one pan! you are speaking my language!!! Plus my kids could eat chicken every night, so this is perfect! I LOVE chicken with Italian dressing like that. This is actually one of my go to meals - so good! You should try it! It's really yummy. Yum. I love these kinds of meals. Especially in the summertime when I have no interest in cooking.